KLAMATH FALLS, Ore. – In a battle for fourth place in the Cascade Conference standings, it was Oregon Tech (15-8, 8-5 CCC) defeating Evergreen State (9-8. 7-6 CCC) by a score of 75-70 Sunday afternoon at Danny Miles Court. Five Oregon Tech players scored in double digits Sunday night led by Juniors Nohea Waiwaiole and Mikaela Shumaker who scored 14-points each in a convincing win for the Hustlin' Owls. Tech led for over thirty-minutes compared to Evergreen who led for less than seven. It was the Geoducks who got off to a hot start generating an 8-0 lead in less than two-minutes. The Owls struggled to get the ball to reach the bottom of the net in the opening minutes, missing eight shots before finally converting a field goal and going on their own 9-0 run to take a 9-8 lead with 5:36 remaining in the first quarter. The Owls extended their lead to 7-points on a Megan Morris steal and lay-up, as she would finish the game with 13 points. Evergreen would not be deterred and tied the game at 25 with 6:11 remaining in the first half. On the next possession Evergreen's Kaelin Williams-Kennedy drilled one of her three 3-pointers to give Evergreen their first lead since halfway through the first quarter. Nohea Waiwaiole and Amanda Constant hit back to back 3-pointers to aid Evergreen's scoring streak. Eventually the teams headed to the half tied at 34. Mikaela Shumaker went on a 6-0 run of her own to start off the third-quarter to give the Owls a small cushion that grew into a 13-point lead when Amanda Constant hit a 3-pointer with 2:58 remaining in the third-quarter. The lead got as big as 14-points with 5:57 remaining in the game, however the Geoducks would not quit. 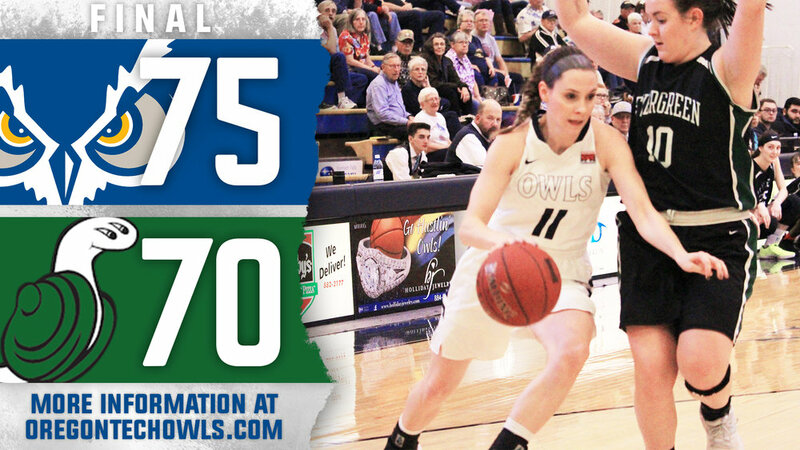 Jahpera McEachin nailed a 3-pointer to cap a mighty Evergreen comeback that cut the Owl's lead to just 6-points with 3:02 remaining in the game. The game remained a two-possession ordeal with just 0:33 seconds remaining when freshman Abby Kreiser drew a foul and hit both free throws to ice the game. Tech won by a final score of 75-70. The Lady Owls will be back in action Friday night in Portland, OR when both the men and women head north to battle Warner Pacific.